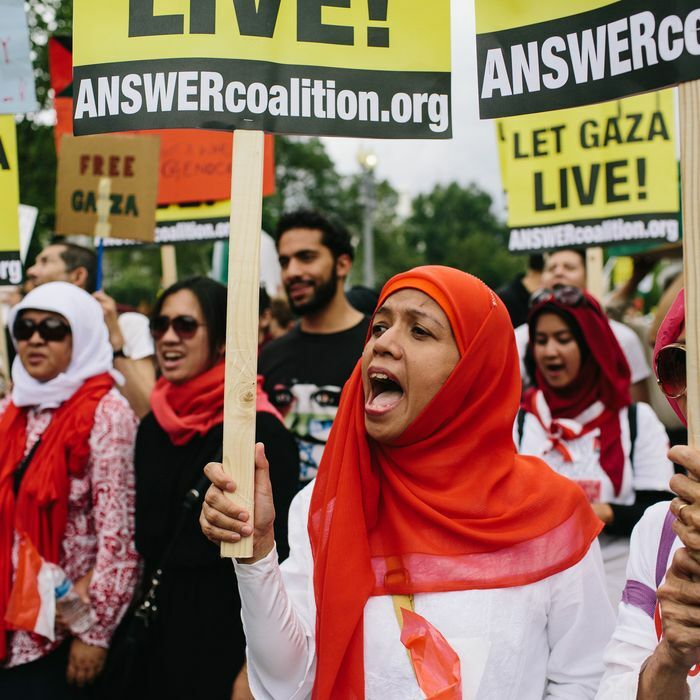 People gather to rally in protest against the violence against the Palestinian people in Gaza on August 2, 2014, in Washington, D.C. These days, the debate over free speech on campus centers largely on loud, chaotic incidents like the riots at UC Berkeley in response to Milo Yiannopoulos’s planned talk, or the smaller but also violent incident at Middlebury College sparked by Charles Murray’s visit there. It’s understandable why events like this garner so much media attention, but, in reality, there are a host of other free-speech issues on college campuses that are far quieter, and which don’t always follow the usual, oft-condemned, “The left is trying to shut down the right!” script. That doesn’t mean they’re less important. Take, for example, a lawsuit announced yesterday by the Center for Constitutional Rights and Palestine Legal, legal organizations that deal with progressive issues and with Palestinian advocacy, respectively. Those two organizations are helping a group of Fordham University students sue the school over its protracted attempts to delay and then kibosh the creation of a chapter of Students for Justice in Palestine, a pro-Palestinian civil-rights and advocacy group. The case is a useful reminder of the arbitrary, discriminatory speech standards that can take hold when free-speech norms erode in a given community — or, in the case of Fordham, were never that strong in the first place. Since November 2015, reads the petition filed yesterday, Ahmad Awad, currently a senior, and a group of other students have been trying to set up a Fordham chapter of SJP. Awad has two Palestinian grandparents, the document notes, as well as another grandparent who survived a Nazi labor camp. Despite the fact that registering a new club at Fordham is supposed to be a relatively pro forma process, the complaint and the accompanying press release describe a bureaucratic ordeal stretching out over the span of two academic years in which Fordham administrators repeatedly delayed the creation of the group, peppered Awad and his friends with the sorts of questions that the heads of other student groups aren’t typically required to answer, and, eventually, after the students had jumped through all the requisite bureaucratic hoops and gotten approval from Fordham’s student government, simply cancelled the group out of existence. After consultation with numerous faculty, staff and students and my own deliberation, I have decided to deny the request to form a club known as Students for Justice in Palestine at Fordham University. While students are encouraged to promote diverse political points of view,and we encourage conversation and debate on all topics, I cannot support an organization whose sole purpose is advocating political goals of a very specific group,and against a specific country, when these goals clearly conflict with and run contrary to the mission and values of the University. When one student asked Eldredge whether his decision could be appealed, Eldredge wrote back that no, it couldn’t. Shortly after that, the lawyers got involved. A student also faced disciplinary proceedings for peacefully protesting Eldredge’s decision, noted the Foundation for Individual Rights in Education in February — when it named Fordham one of the worst ten schools for free speech in the U.S. as a result of this episode. But this is far from an outlying event at Fordham, a Jesuit institution which has over the years faced controversies over its free-expression policies on issues ranging from condom distribution to its lack of a “free speech zone” for students to protest without consequence. Now, this isn’t a pure First Amendment case, because Fordham is a private university — Awad and his friends are suing based on the claim that Fordham violated its own free-speech and student-organization policies, not that the U.S. Constitution was violated. But this case is a very useful reminder of what happens when speech claims are adjudicated — or, in this case, given the lawsuit, are attempted to be adjudicated — on the basis of subjective terms that mean different things to different people. Take Eldredge’s note: Who decides what is and isn’t “polarizing”? Who decides which countries can and can’t be criticized, and why? Who decides which views are and aren’t a “barrier to open dialogue”? There’s widespread disagreement on these sorts of questions. That’s the beautiful thing about the liberal conception of speech rights, whether expressed by the First Amendment on public campuses or codes of conduct on private ones — we can eschew these unanswerable debates, because the default position, with just a few very narrowly carved-out and frequently misunderstood exceptions, is that everyone gets to speak, precisely because everyone disagrees on so much on which sort of speech is harmful. There are people who really and truly and genuinely believe that the BDS movement threatens the Jewish people themselves (by threatening the state of Israel), and is therefore terribly dangerous — their advocacy can explain Andrew Cuomo’s very bad executive order on this subject. They believe this just as strongly as some lefty students believe that the mere presence of a race-baiting conservative speaker on campus poses an imminent safety risk to students who are members of marginalized groups. That doesn’t mean I lend equal weight to these two claims, or that you should — it means that there is genuine, heated disagreement on these sorts of questions, and that in different communities in America, campus and otherwise, entirely different standards prevail as to what sort of speech is considered so harmful it should be suppressed. The liberal conception of free speech says: Sorry, it doesn’t matter how harmful you think this speech is. Unless you can prove the speech in question fits into one of those very specific, very-difficult-to-qualify-for categories, everyone gets to say their piece. It’s an imperfect, cacophonous arrangement that leads to a lot of hurtful words, but it’s the best we can do. And it’s important to realize what it would mean to abandon it, at least in campus settings: Students would be totally at the whims of administrators and their own political biases, or whichever groups of their peers were politically or numerically dominant. Under a system in which subjective claims of harm — “polarization” or “shutting down debate” or whatever else — were regularly accepted as a justification for suppressing speech or political opinions, liberal and left students would find their speech suppressed all the time. Just because the most high-profile recent examples of campus speech getting shut down have affected the right doesn’t mean that would be the norm were free-speech norms and rules to crumble more completely — or that there isn’t already a long history of campus administrators targeting left-of-center causes ranging from anti-war activism to, as is the case at Fordham, criticism of Israel. Max Fisher was right when he wrote in 2015 that there are plenty of conservative “PC police” on college campuses who are just as enthusiastic about suppressing speech as some lefties and liberals are — these stories just don’t generate as much media outrage. So the Fordham episode is just the latest in a long line of vivid examples showing that the campus-free-speech debate extends, or should extend, far beyond the visceral satisfaction of watching a reviled speaker get turned back by rowdy students or rioting outsiders.